Luxe can help you create a beautiful design for your perfect wedding celebration. 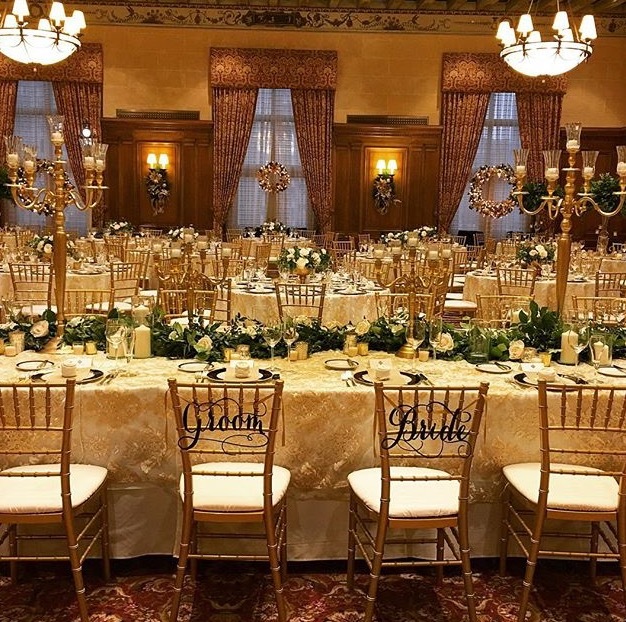 We offer high-end wedding rentals in Detroit at prices you’ll love. Choose from our wide selection of wedding furniture, drapery, linens, chair covers, and custom details and adornments to give your wedding just the right touch. Our designers will go above and beyond to give you the event you’re dreaming of. We will work closely with you and really listen to what you want. Beginning with your initial consultation, selecting furniture, and finishing it off with the small details, we’ll be there for you. Benefit from our wealth of experience! We have put together successful weddings for years, giving couples and their guests memories that last a lifetime. The Luxe stylists work closely with you to create the unique look you’ve envisioned. We take creating your perfect event very seriously, and will do everything we can to make sure you are completely satisfied. With our selection, there’s a lot to choose from. Give your wedding just the right touch of rustic charm, modern design, or classic look you want. Plush cushions and seat covers customize your look even further, giving it your own personal touch. Resin Core Chiavari Chairs – We offer some of the most durable and highest quality rental seating available, including our Resin Core Chiavari Chairs. These modern yet classic chairs are available in Mahogany, Silver, Gold, Black, and Clear. Dior and Infinity Chairs – These are perfect for your head table or mixed into a few tables at your reception for just the right touch of elegance. These chic chairs give your wedding a one of a kind look with endless possibilities and arrangements. Farmhouse Tables, Chairs and Benches – For just the right amount of rustic charm, choose from our selection of farmhouse tables, chairs, and benches. You can create a unique and charming feel throughout your entire design or just in certain areas. Beautiful Linens – Our linens are carefully hand selected by our designers and meet our high quality standards. Choose from our large selection of linens and find the right color and style for your wedding. Draping Options – The right draping can give your wedding a unique and refined look to define your overall style. We provide many head table backdrops, entrance draperies, and complete room drapes to give your wedding the finished look you want.